The Pro Sanctitate Movement in Gozo marked Bishop Nikol Cauchi's 81st birthday last Tuesday with a concelebrated Mass led by Mgr Cauchi together with Gozo Bishop Mario Grech, the vicar general Mgr Giovanni Bosco Gauci and a number of priests at the Good Shepherd church in Victoria last Tuesday. A small party was held in the church annexe, where Mgr Cauchi cut a birthday cake. Mgr Cauchi was also presented with a CD entitled Is-Saċerdoti Tagħna (Our Priests) released by the Xagħra altar boys group. 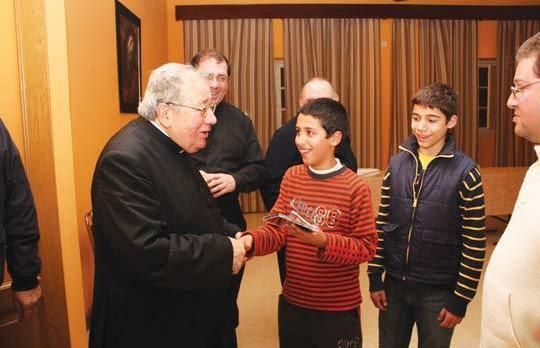 Picture shows altar boys Stefan Bajada and Joshua Vella presenting a copy of the CD to Mgr Cauchi.